Cardboard has long served as an inexpensive plaything for cats. It’s a cheap material you can use to build a climbing structure, or a cozy place for them to hide. Far from a weekend craft project, these cardboard landmarks won’t be an eyesore sitting in the corner of your living room. Starting life as a $34,000 Kickstarter campaign that’s almost halfway to its funding goal, you can pre-order one of seven different designs with a donation of around $44. That’s considerably more expensive than just grabbing an empty cardboard box from the grocery store, but these come with matching printed graphics, and assemble into impressive 3D creations in about five minutes. Your cat will live in the fanciest house on the block. 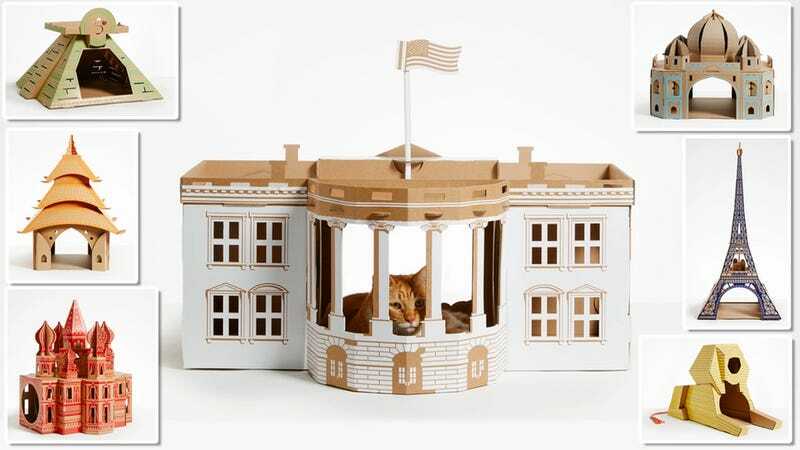 The replicas each also come with unique features to keep your pets entertained, like a springy flag atop the white house, or a secret place for treats inside the Eiffel Tower. Does that mean your cat won’t eventually turn the beautiful structure into a heap mountain of shredded cardboard? Absolutely not. But if it keeps it distracted from annihilating your sofa for a week, it’s totally worth the cost.